When an RM is running a game session, it is helpful to be able to keep his notes, maps, etc. a secret until he is ready to reveal this information to the Players. It is also very helpful to an RM to have frequently used charts, information, etc. at his finger tips. RM Screens serve both purposes. There really is no need to purchase screens, especially when you can make screens that are customized to your specific needs and desires. Below are the detailed instructions for how to create your own RM Screens. You can create your own panel sheets (containing the information you want) if you desire, or you can download pre-made PDF’s I have available for you. You will need a poster board; a piece of construction paper; a yardstick/ruler; a razor/box knife; a pencil; glue, and a printout of your panel information. 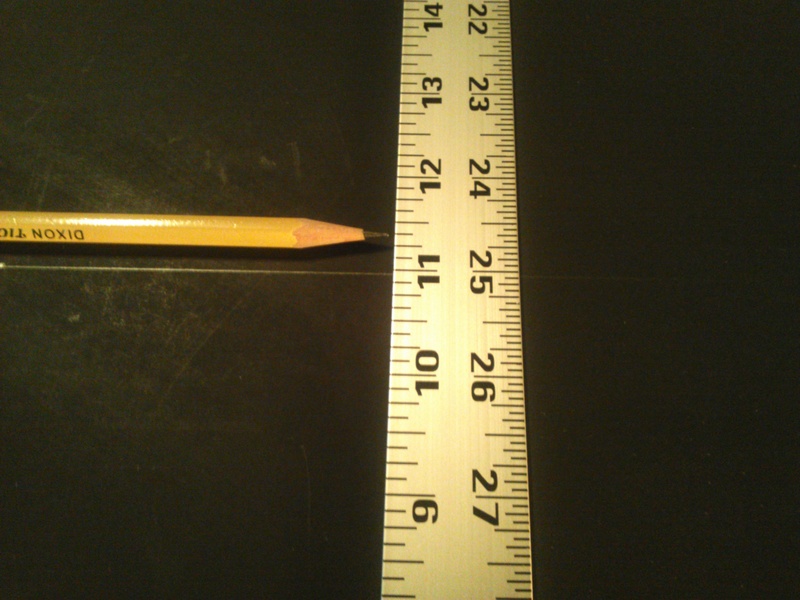 Vertically measure your poster board (from the long edge) 11 inches (the length of a standard piece of paper). Do this in several places so that you can then make a horizontal line that will evenly stretch across the poster board 11 inches from the long edge. 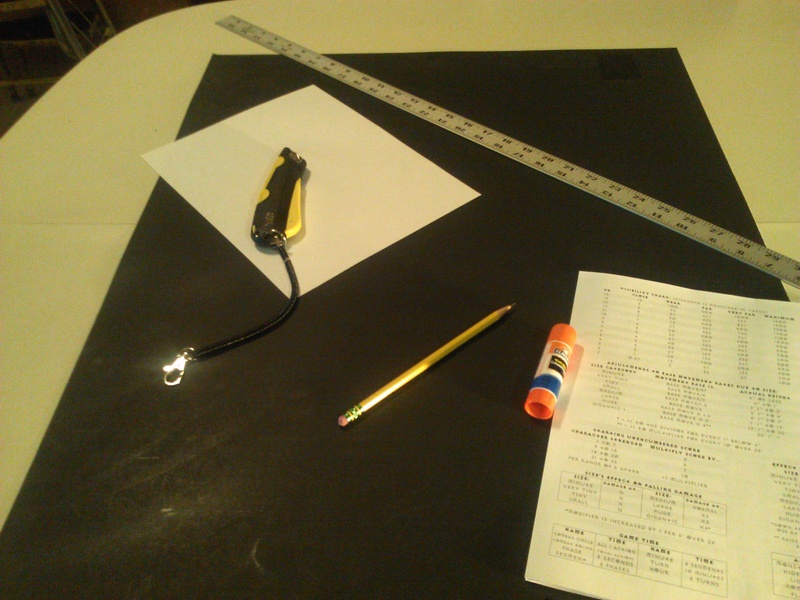 After your measurements are done, and you have drawn the line, you should be ready to cut the poster board along the horizontal line. 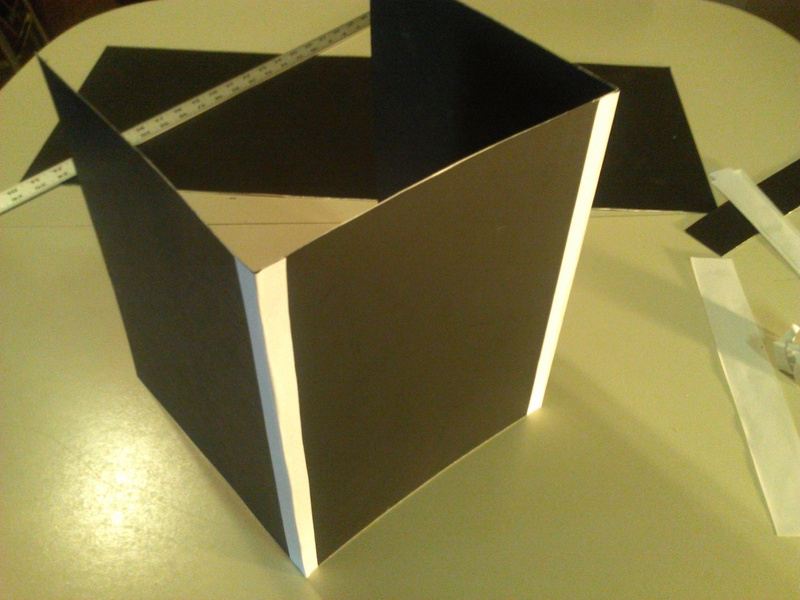 After you make the cut, you should have two pieces of poster board that are roughly equal in size. You are now going to take one of the pieces of poster board, and make it tri-fold. To do this, you will first need to lay a piece of standard paper at the right edge of the piece of poster board. 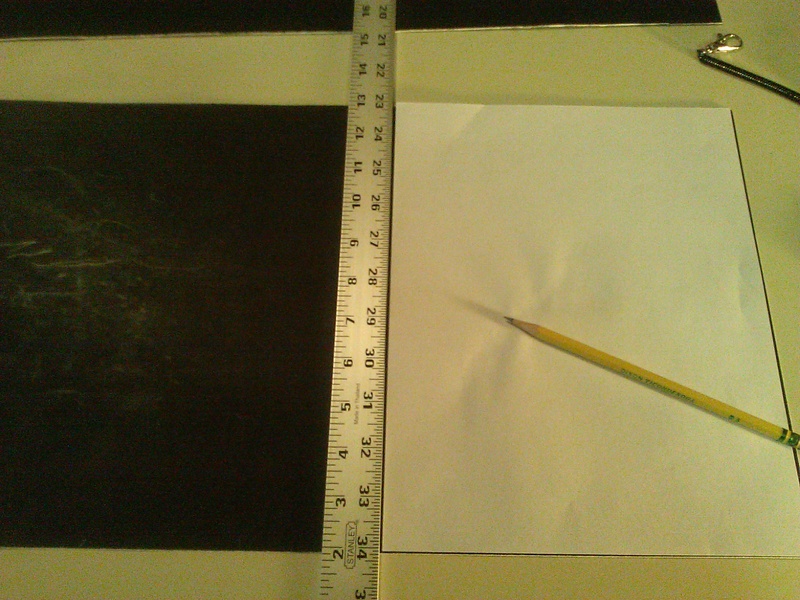 Give yourself a slight bit of space to the left of the paper, and draw a straight line down the poster board. Move the paper so that its right edge is flush with the line you drew. To the left of the paper, give yourself a little extra space, and then draw another straight line. 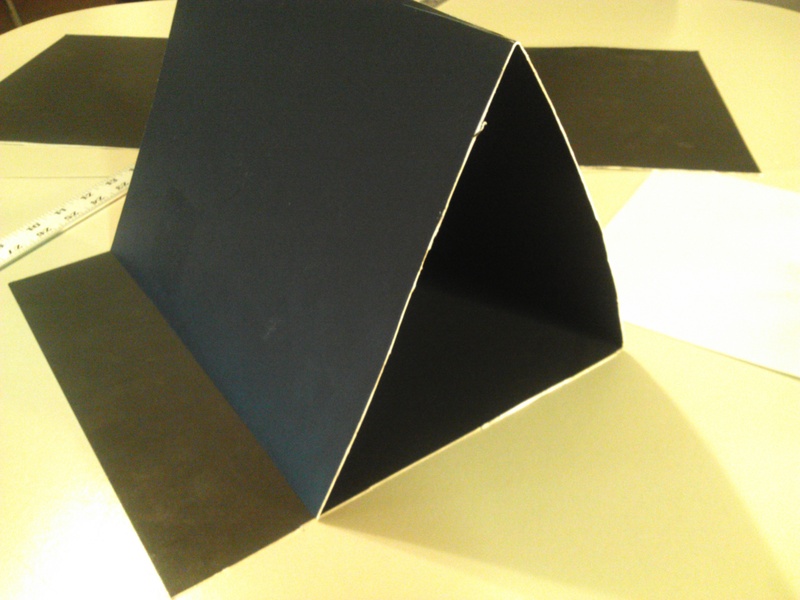 Be mindful that your goal is to be able to fold the poster board in on itself until it is just larger than a standard piece of printer paper. You will now take the razor/box cutter and lightly score along the lines you drew. Do NOT cut all the way through. Then bend the poster board at the score points so that the scored area breaks and the poster board can easily bend. 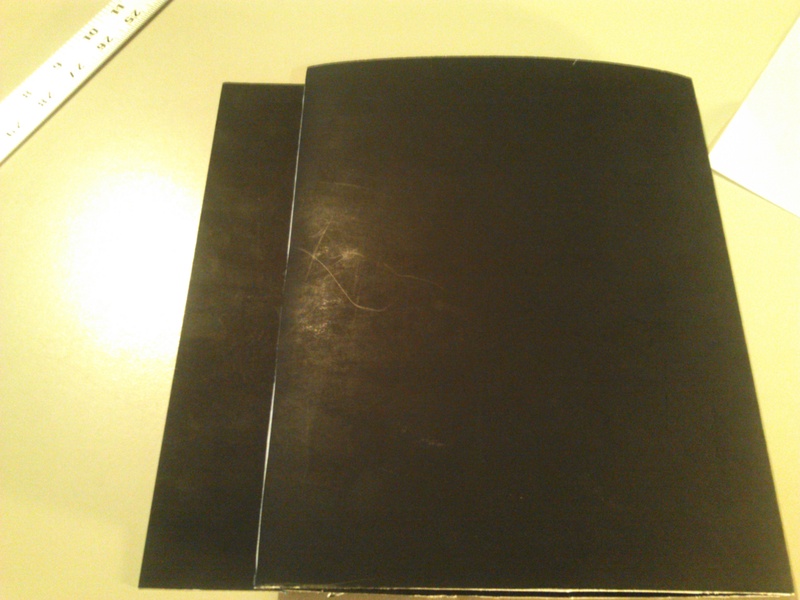 Once you have completed the steps above, you should have a tri-fold piece of poster board that can fold in on itself. 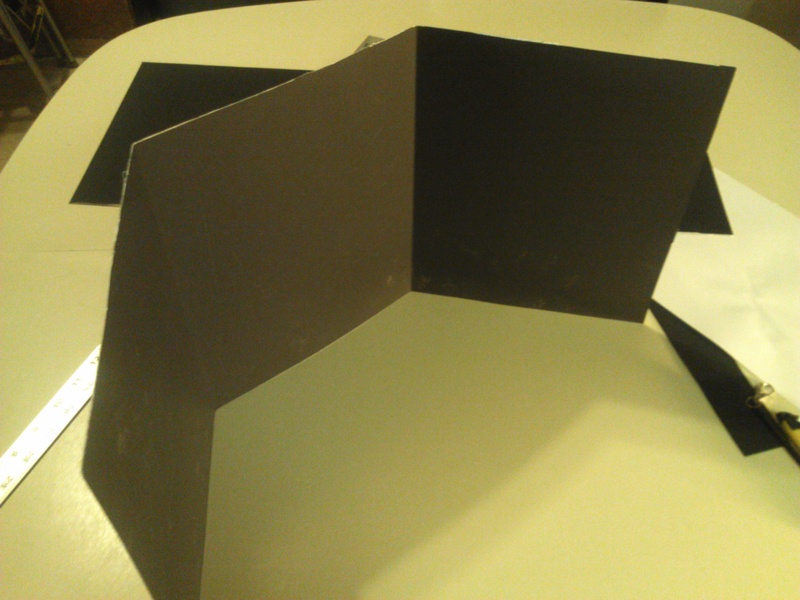 Lay the folded screen flat, and you will see excess poster board. Draw a line along the edge of the fold. 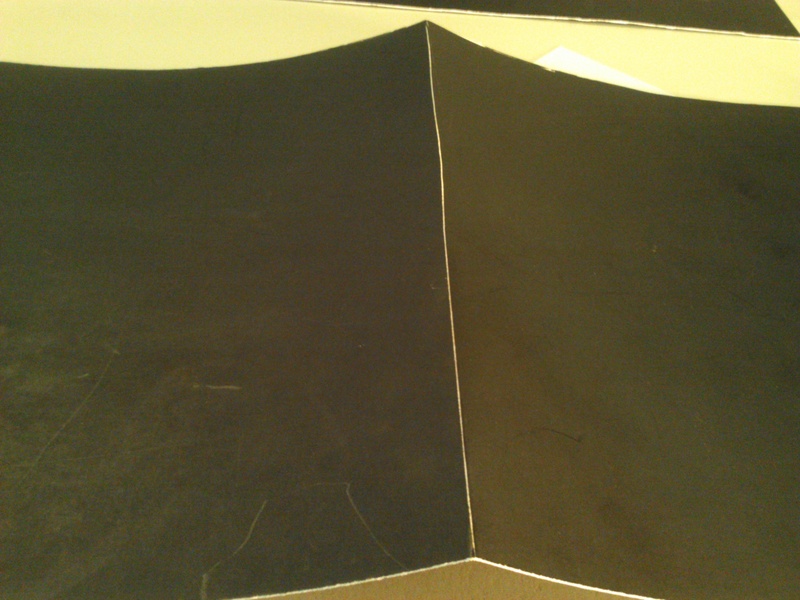 Cut along the drawn line, and remove the excess piece of poster board. 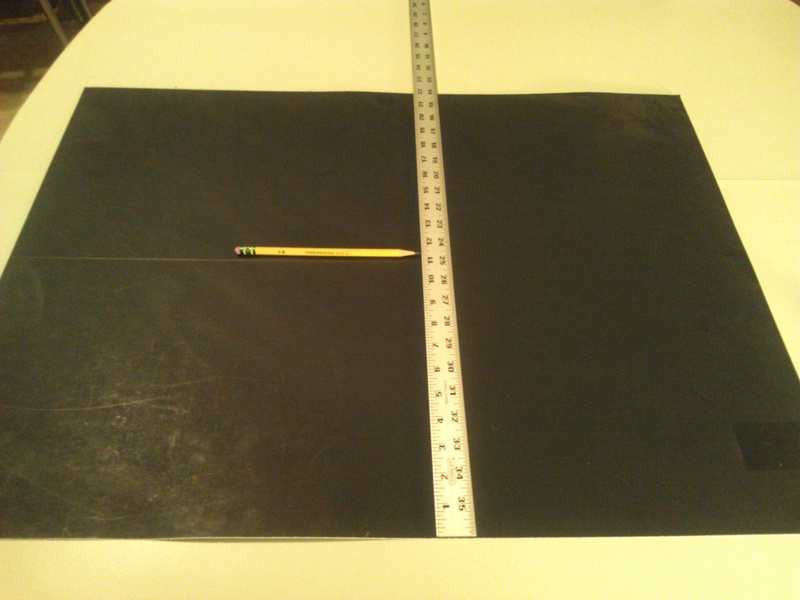 Then, when it lays flat, it will be only slightly larger than a standard piece of printer paper. Your screens should be able to not only fold flat, but should be able to stand… After all, what good are screens if you can’t stand them up? 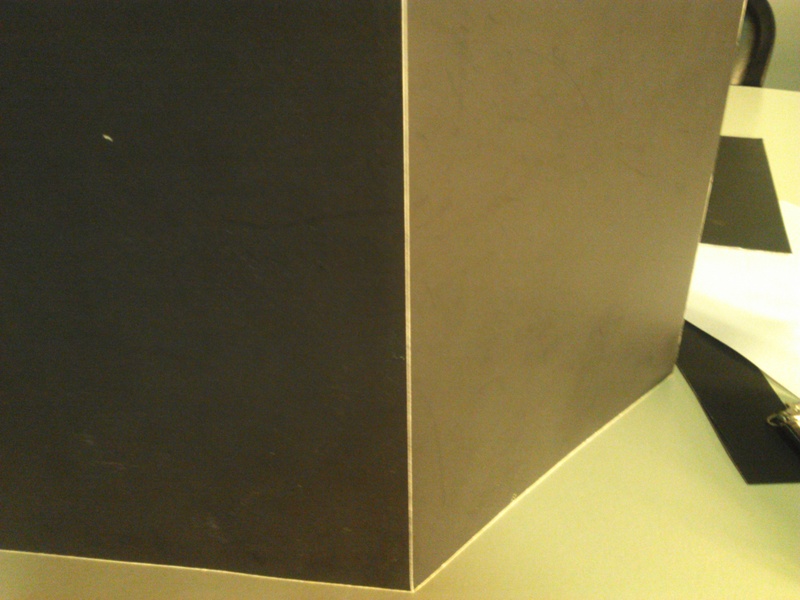 As you can see from this image (and the screens you are making), the scored edges are weak, and will break after minimal use of folding and unfolding the screens. We will remedy this by reinforcing the scored edges. 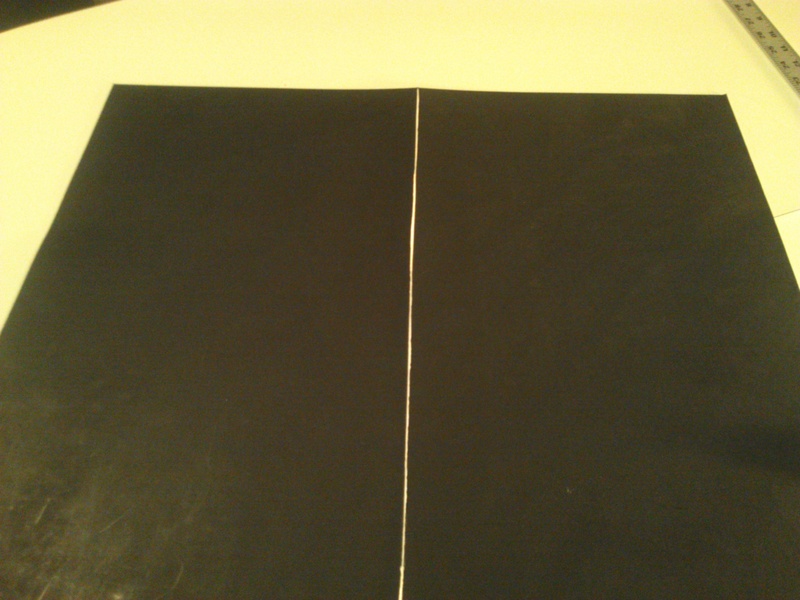 Cut strips of construction paper 11 inches long, and 1 to 2 inches wide. 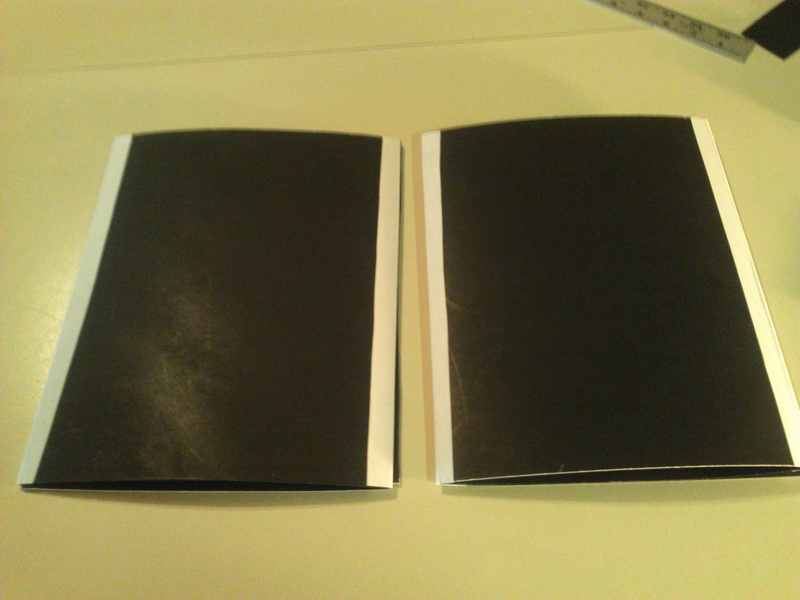 Note: I am using white paper in these images so that you can see the contrast and better illustrate my instructions. 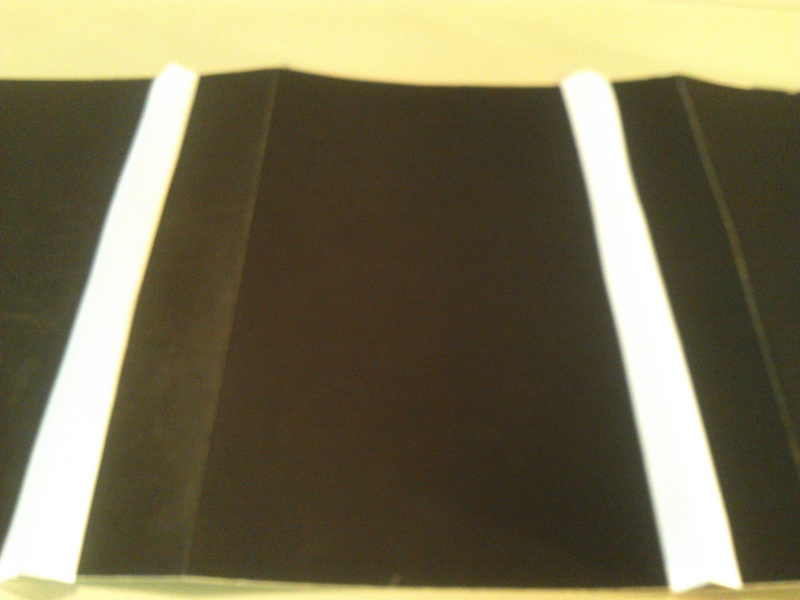 Fold the strips of construction paper in half, so that they are 11 inches long with a bend half-way along its width. 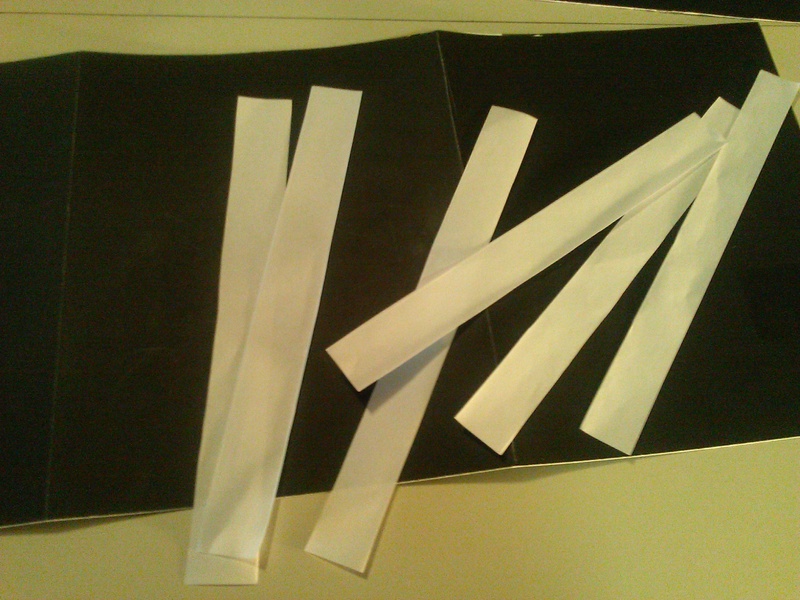 Glue the construction paper strips to the scored edges of the screens. Make sure you can fold and unfold the screens. You now have one screen that we will finish in a moment. In the meantime, repeat the above steps on the second piece of poster board. Now that you have both screens made, it is time for us to finish them up. Glue the RM Screen Panel information to the inside of the screens. 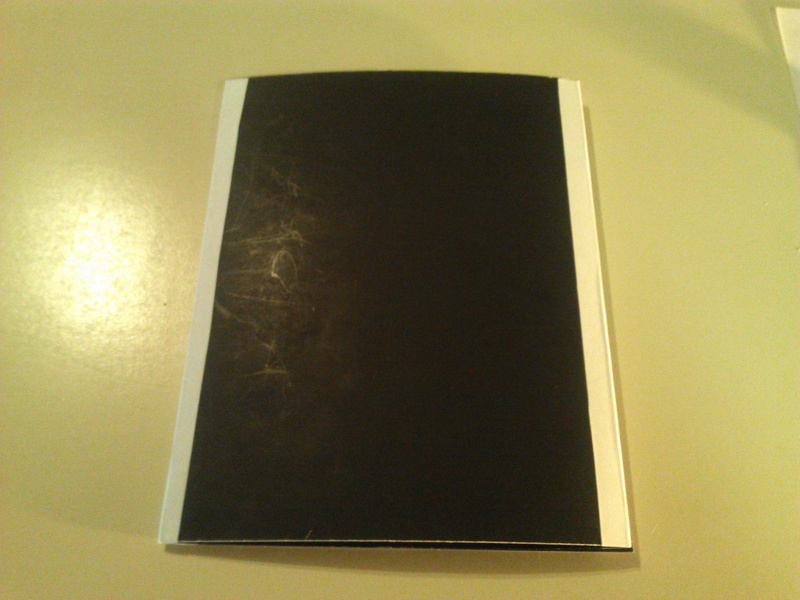 I provided 5 panels of information, which leaves one blank. You can stand the screens where the blank panel is behind the second screen (as shown) or you can use this spot to add custom information (Critical Charts, etc.). You can leave the front of the screens blank, or you can add artwork, Player information, etc. It is up to you. I Hope you enjoy making these RM Screens. You are by no means limited to what is written here. You can customize them to suit you, or come up with your own design. I wish you many happy years playing Mystic Rune™. 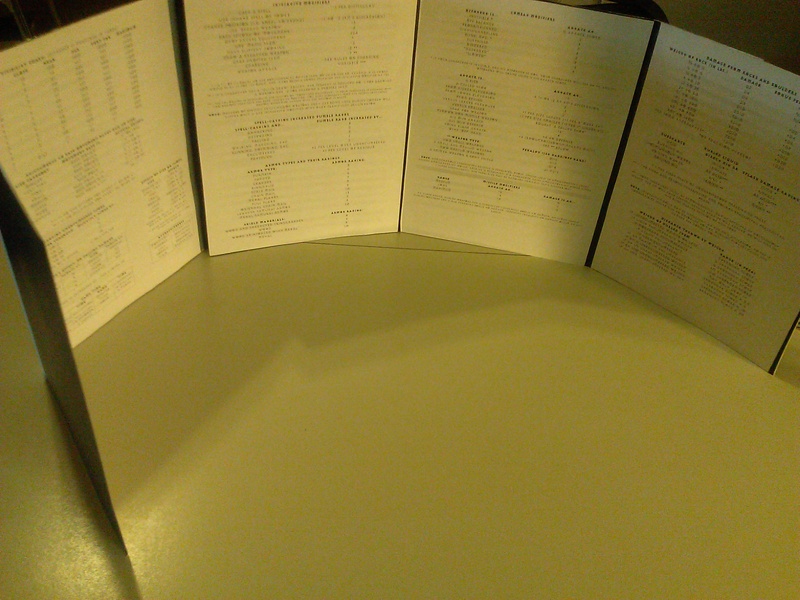 Print Double-Sided and then fold in half like a booklet.